For the second time in two weeks, NDP Member of Parliament Pat Martin has found himself in hot water for verbally attacking a female voter at a federal election all-candidates forum. The moderator said that Pat could have an opportunity to answer and I said, ok, lets get on with it." "I know some people are frustrated and I know the questioner has been barred essentially from my office -- we don't always take her calls. But my staff is a unionized staff, they have a right to refuse unsafe work, they have a panic button under their desk, and when they're being harassed or treated badly they have a right to deny that person access to the office, especially after multiple, disagreeable visits. They don't have to take abuse, and, uh, as a former union rep I wouldn't ask them to." "I have never been to his office even once. I don't even know where it is". 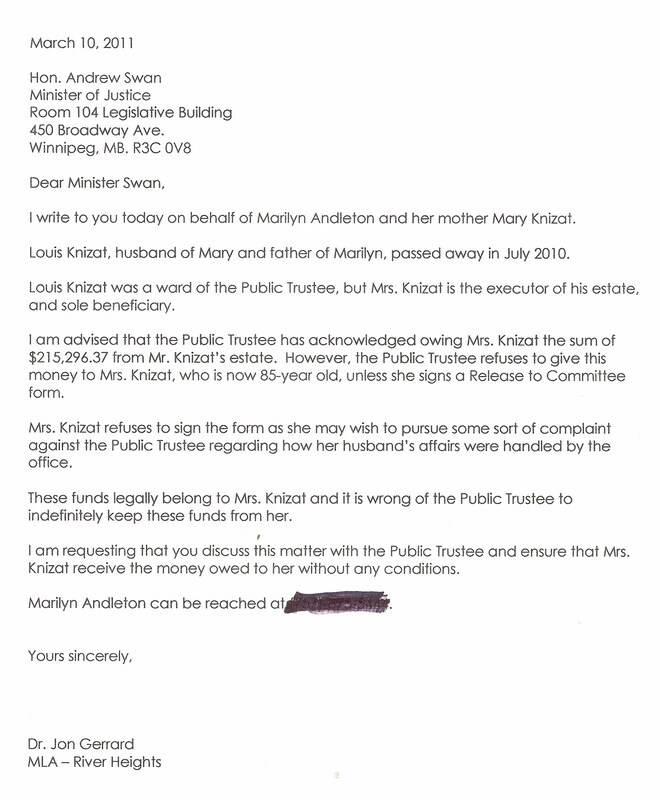 Earlier this week, TGCTS exclusively reported that Martin had been forced to issue a written apology to a different woman in Winnipeg Centre whom he had falsely accused of having been under a restraining order, in a response to her question at an April 12 town hall about whether he actually lived in the riding. "My staff has informed me that I had you confused with another constituent who has been banned by our office for harassment." he wrote to Kim Calder. "Well, he is still confused" said Jones, a university instructor and community environmentalist. She maintains that a pattern has emerged of how Pat Martin responds to women who criticize his record during this campaign.
" The politics in this province has become dysfunctional but the dysfunction has become considered normal among the ruling class. He thinks it is normal to attack people with impunity if it will get him reelected." Jones called NDP national leader Jack Layton's office on Friday to complain and has not been called back. When contacted by TGCTS, Bellamy said "we do not comment about our interaction with individual constituents", adding he was not at the meeting and had not heard Martin's remarks. The April 26 meeting at Magnus Eliason Community Centre was organized by the Spence Neighborhood Association, West Broadway Development Corporation, Daniel McIntyre - St. Matthews Community Association, and the West Central Women's Resource Centre. At an April 27 council meeting, Winnipeg councillors proclaimed deeply concerns over the housing crisis, crumbling sidewalks and roads, and funding for rapid transit. They heard about genuine charitable need and legitimate questions about the source of repeated "official" assumptions that 250,000 human beings will come to see the "iconic" Canadian Museum for Human Rights (more than the Museum of Tolerance in Los Angeles). Yet in a unanimous vote, all 16 civic leaders, led by Mayor Sam Katz, added yet another $3.63 million to the $11 million "interest free" loan the city has already handed over, to the pet project of millionaires. However, a vast majority of online comments left on mainstream media stories reflected that readers did not agree with the acquiescence of their elected representatives to the insatiable desire of museum acolytes that taxpayers backstop their failed private-sector fundraising. In fact, even supporters of the Museum were not impressed at all. -- The first story of the Winnipeg Free Press, which ignored the questions that were raised with council about the $11 million loan, recorded 69 comments (some of which were duplicates). Despite the years of unabashed cheerleading for the CMHR by the broadsheet that claims to be leading a revolution in reporting community issues, their readership continues to reject their party line. The funding faucet is now officially on, and will only become more of a torrent as the years go on! Asper could make a good gesture by donating the $4,000,000.00+ he received for the stadium fiasco into this other bottomless funding pit. I'd be OK with this final payment or "relief effort" or whatever you would like to call it, as long as it came with signed documentation by the City, Provincial, and Federal government, and agreed to by those developing the Human Rights museum, that any further funds needed would be raised privately. While I think a national museum outside of Ottawa is a good thing, I would have rather have seen money put towards our roads in the city. It's a crumbling nightmare. 'St. Norbert Coun. Justin Swandel used stronger language. Wow talk about disrespecting the electorate. That's the precise problem here no one at the city cares about the tax payer. Just raise the frontage levy and throw away $3.6M to a project, all the while who cares about the tax payer. Just tell the tax payer to shut-up because we have to get this done. Nice. My councillor has just lost my vote. What a bunch of sheep. So we're struggling to find budget for roads...but we're able to magically come up with $3.6M for a museum that is not a primary need of this city? I don't get it. No wonder why Winnipeg NEVER puts in overpasses on any of our "freeways" or "highways" crowded with light intersections. Gas prices are soaring, so we really need to start thinking ahead to make more efficient roadways. Why not just levy a new tax and call it the CMHR subsidy. I was at Seven Oaks pool last night. Almost every 2nd locker is broken. So they can't keep up our city pools but they can give more money to the Asper projects??? I've seen the Asper residences in Winnipeg. They are clearly capable of picking up this tab themselves. So why aren't they? This is disgraceful and a slap in the face to many taxpayers who in the current economic times are one paycheque away from foreclosure or not feeding their kids. I'll never set foot in this museum and they are kidding themselves with their statement of how people will travel from across the country and continent specifically to visit the CMHR. Well, maybe the other rich donors will at least. -- A revised FP story, found in print as well as online the next day, lumped the Museum tax break into a story about other decisions, entitled City finds $14.6M for three projects; Extra expenses won't boost 2011 budget. Still, the public was not pursuaded, and none of these comments got a single "thumbs down" from other FP readers. "City council found a way Wednesday to spend an additional $14.6 million on a trio of existing projects and programs without adding a dollar to its 2011 spending plans." Talk about voodoo economics. I am a taxpayer. One way or another this is going to cost me. If the CMHR is getting $3.6 million dollars that was coming from the federal government to Winnipeg, what is that money NOT paying for? Roads, other infrastructure, etc.? So now there is $3.6 million LESS that could be used to fix our roads. At the very least the federal government has $3.6 million less for its programs. When will people learn? WE are the taxpayers. If $3.6 million wasn't going to the Waterfront White Elephant, that money would be going to fix our city. Is city council suggesting that somehow $3.6 million worth of problems don't need to be fixed? Thanks to the Mayor and his sheep for robbing Winnipeggers current and future. Where is the accountability? Why are they coming to the financial well over and over again? I will admit that I think this whole museum is a waste of money. That being said, the decision has been made to build it, so now we build it. However, that does not mean its a open cheque. There has to be accountability, this can not become (although it may already) a bottomless pit. St. Norbert Coun. Justin Swandel used stronger language. "We should just shut up and get this done," he said. Ah yes, a familiar refrain from those who advocate strongly for an idea museum based on human rights. I wonder where they'll put the freedom of speech zone. Oh yeah, there isn't one. at 4:00 PM ET At one time I was an enthusiastic supporter of this museum. However, it seems it is costing far more to construct than originally planned and the proposed exhibits do not adequately reflect the wishes of the taxpayers who are, for the most part, the largest contributors. I fear it is becoming a monument to the Asper legacy in this city as well as the faith that they are a part of. at 4:21 PM ET Its a complete joke. These councillors get elected by shutting their mouths and then six months later they are doing whatever they want with our tax money. The whole coucil including the mayor should be thrown out of office... I just do not like my tax money being spent on museums when our mayor is trying to find ways to tax us extra to pay for our roads that are falling apart. This entire city council should be recalled by their wards and demand answers for this spending. This was not mentioned in the election campaign.. We need recall of our politicians in manitoba. at 5:55 PM ET I have now been trying for two years to get the city to clean up the nearby city operated park. The children's playground area is overgrown with weeds. The park was mowed only a single time last year. In short it is a disgraceful, unkempt mess. And yet there seems to be endless millions to throw at this museum and other private pet projects. at 11:14 PM ET It is becoming discouraging to always hear that the Human Rights Museum needs "more" money. If citizens of this city managed their personal finances like the forces behind this project they would have to be on welfare by now. at 7:16 AM ET Imagine if this money went to improving human rights in Manitoba, or to all the social programs who's federal funding was pulled from them this year.. I think it is great that there will be a human right's museum, but I am constantly appalled at the state of Winnipeg. at 10:42 AM ET I'm supportive of the idea, but it seems like this museum project has been very poorly managed. I would like to see a full auditing of their books before they see a dime more in public money. -- The Winnipeg Sun had run an editorial stating " City council should ignore the outstretched hands of museum officials asking for another handout from taxpayers"
This is just mind boggling. Who the hell WANTS to go to this museaum when it's done? Where is the customer base that is going make it successful? "Hey kids....where do you want to go this fine Saturday?" The money should have gone to fix our roads. Nice going Sam & Company. Continue to waste more of our money on this White Elephant. You have told all of us, money is tight and you turn around and do this. What a crock of BS when it comes to your pet projects. Just like the new stadium. Keep all of your backroom buddies happy as you continue to raise fees to support your so called good for the city. Related: Tom Brodbeck's column in today's Winnipeg Sun "Spending disorder; Swandel crazy to blast prudent citizens"
Pat Martin, the incumbent NDP Member of Parliament for Winnipeg Centre, has been forced to issue a written apology after he made a false accusation about a female constituent at an All - Candidates meeting on April 12th. The woman, Kim Calder (formerly the traffic reporter for The Great Canadian Talk Show) is a resident of the riding who with other voters, voiced concerns at the open microphone about Martin's record as their representative in Ottawa.
" I asked him about the issue of not returning calls, not only I but three others had the same question. I also asked Mr. Martin who he was representing. Mr. Martin stated that he has a house on Canora, but does spend time in Vancouver where he owns property that is rented out. (Yet, in the Winnipeg Sun dated April 24th, in a quote to Tom Brodbeck, Mr. Martin stated that he just went through a divorce and his wife received the property on Salt Spring Island.) "
What happened next stunned Calder. "As I sat down, Mr. Martin said to me, "how many restraining orders do you have against you?". Somewhat perplexed at the question, I replied "none". His reply was "that isn't what I heard". " After the session, Calder immediately went up to Martin to challenge his remark. "When I tried to ask Mr. Martin who was his source on this allegation his only response was "I'm going to take out a restraining order against you", then bolted out of the building. Some had come up to me and said that at first they thought I was a crazy person who had lots of restraining orders against me." A number of people in attendance, (including another candidate who participated in the forum), contacted TGCTS about Martin's remark, and were incensed. "Mr. Martin not only intended to discredit the constituent and deflect criticism of his parliamentary record, but also willfully engaged her in open embarrassment during this community event." wrote photographer Darron Field. "His behaviour was deplorable and, as a citizen involved in the democratic process for this federal election, I suggest that he be held to account. It's this type of personal attack that has damaged the political process and turned voters from engagement, deep into apathy." Another eyewitness was Fred Morris, a longtime Liberal party member and a candidate in the recent Winnipeg civic election. "Mr. Martin should not have personally verbally attacked a constituent. It is even more surprising that Mr. Martin did not seem to be entirely sure of his own allegation. Mr. Martin did not seem to want to clarify his remarks to Ms. Calder after the meeting. NDP Leader Jack Layton should apologize to Ms. Calder. " But when Calder tried to complain to Martin's leader, Jack Layton distanced himself from the 14 year representative of Winnipeg's inner-city. "On April 13th I contacted Jack Layton's office in Danforth riding, was told by his campaign manager that I had to call the national office. 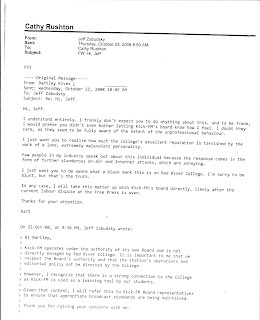 Which I proceeded to do, was told that there was nothing they could do and that I should contact Pat Martin's office." Calder explained that she then spoke to the campaign manager for the NDP in the riding, Keith Bellamy.
" I informed Mr. Bellamy of the situation and demanded a public apology as Mr. Martin had publicly slandered my good name. I challenged Mr. Bellamy and Mr. Martin to go ahead and find ANY restraining orders against me." It was only after an follow-up email to Bellamy demanding an apology by April 19th at 8 PM, that she finally received a letter which was hand delivered to her home. Calder admits she is a volunteer for the Liberal candidate in Winnipeg Centre, Allan Wise, but says her presence at the meeting was as a constituent who would be represented by Martin if he is re-elected. She was concerned about the poor response she and others have received from Martin in the past, and wondered if he was being distracted by not living in the riding. Despite the letter, she is still not satisfied. "What he said to me was in public, against my PERSONAL life. I did not ask questions about his personal life, instead I get a letter delivered, in private. Since when is it NOT allowed to question not only our MP's, but also our candidates?" Welcome to our new readers from media outlets, government and Crown agencies, universities and colleges across Canada ! Our blog archive contains details of many of the stories you have heard about that were broken on our radio broadcasts on campus radio, and links to those broadcasts can be made available too. Use the search window in the top left corner to get the facts about many important local, regional and national stories from Oct. 2006 - Nov. 2010. The Great Canadian Talk Show is making sponsorships and advertising available for our upcoming return to regular podcasting and online video commentaries. If you want to support the alternative media in Winnipeg and help the people's voice be heard, or have any other inquiries or story tips, please contact martygoldlive@gmail.com. - On Wednesday we'll be at City Hall to question the tax break for the Canadian Museum for Human Rights. 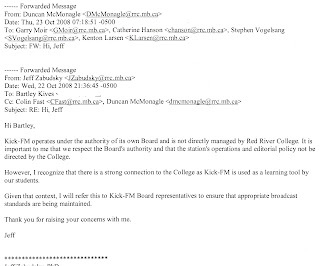 - More surprises found in Red River College's responses to Freedom of Information applications. 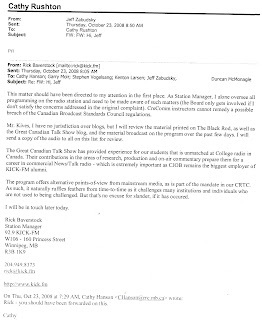 On Thursday, October 1st, 2009, the case of Louie Knizat was brought to listeners of The Great Canadian Talk Show by his daughter Marilyn and son-in-law Howard, in one of the most moving and disturbing stories of government-sanctioned abuse of power we had ever broadcast. Is it any wonder the Trustee controls $140 Million in liquid assets, when they can bully families without having to account to anybody? When they can use the families own money to hire lawyers and fight them in court? When they do not have to be accountable to the Minister of Justice or to the Legislature? Even after Louie died, the bureaucrats continued to try to starve the widow out, insisting she sign off on an unaudited accounting of their exorbitant fees and agree not to take legal action, and threatened to take her to court -- using the estate's money -- to enact their selfish terms when she refused. But once provincial Liberal Leader, Dr. Jon Gerrard, got involved, the sharks from the Trustee's Office shrank to meek goldfish. "Mrs. Knizat is the executor of his estate and sole beneficiary ... 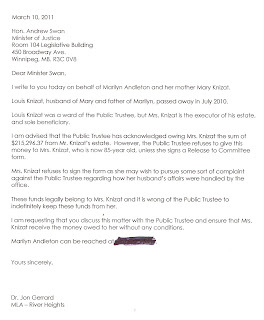 These funds legally belong to Mrs. Knizat and it is wrong of the Public Trustee to indefinitely keep these funds from her." Dr. Gerrard, Dave Shorr and Peter were the greatest ! They seemed truly interested in helping Mom. I told Dr. Gerrard that my crusade with the Public Trustee awareness was not over ! I made that promise to Mom that I would never quit fighting to make the public aware of how the PT works. She asked me if I would ever quit and I told her I would ...... when I'm six feet under ! I made a call the other to the taxation office because the PT did not forward us any of the tax information to complete Dad's taxes. The guy that answered the phone was from BC and he truly was interested in the PT. We spoke for about an hour and he was amazed ! He said he knew the PT was difficult to work with but he had no idea that this was going on ! He said he would go on line and read the stories about the PT and of course check out the radio show we did. Well take care and talk to you soon ! - We'll be at City Hall to question the tax break for the Canadian Museum for Human Rights. I Just learned of the passing of Marley Rae MacDuff, who was very well known in the Winnipeg music and modeling scene and was a true supporter of the work of TGCTS. My deepest sympathies to her family and many friends. With the use of emails, social media, and by making the rounds of local gathering spots, TGCTS has continued to ensure that your elected officials still hear YOUR VOICE on important public issues. Last month, the business plan of the Winnipeg Parking Authority to hike rates and expand their empire hit a little bump on the road to implementation. We raised serious concerns about the complaint process for bogus tickets, credit card charges, and towing incidents ie -- THERE IS NONE. We also pointed out to both the Alternative Services Committee and then to all of Council, that the WPA has no actual citizen or small business representation on its Board, and that our surveys proved that over 50% of pay station machines were either broken or improperly programmed. And for this they want to ding parkers for even more money ?? Even Mynarski Coun. Ross Eadie agreed that as long as Selkirk Avenue had meters, it was an obscenity to pretend they weren't "needed" to encourage parking "turnover" on say, Corydon aka "the elephant in the room". And despite the inability of some reporters to understand plain English, let us reiterate that no one ever proposed paid parking be added to Little Italy; only saying that if the WPA truly believed in the principle of "high demand = meters", Corydon should have been part of their business plan. Since it wasn't, the WPA was clearly targeting neighborhoods that could not defend themselves or didn't have political clout to stop the gouging. That's the way it works in this city. The result of our speech: the Parking Authority, which under former head honcho Dave Hill didn't think the public had anything to say worth hearing, is being required to hold public consultations BEFORE expanding in the Exchange District, Broadway and Portage "corridors" (whatever that term really means). Score one for the listeners. Score one for the people. But it appears our hands-on work at 510 Main Street has just begun. Last Friday afternoon, City Hall tried to sneak another one past the taxpayers -- $3.63 Million of your (federal) taxes was being proposed for re-direction to the Canadian Museum for Human Rights, the announcement timed to ensure minimal actual reporting by mainstream media into the actual motion. Executive Policy Committee would surely wield the rubber stamp to allow the City to act as middleman to enable more public dollars be chucked into the bottomless pit that is still short $25 million of their revised costs. The latest round of panhandling was borne of the hubris of millionaire supporters, who assured all levels of government they could raise the money for the Museum from private sources and then failed miserably at both containing costs and understanding the meaning of "budget" and "accountability". TGCTS supporters said 'not so fast', and urged us to ensure some accountability be brought into the process. - "This is the hope of the world"
- "Our friends in the us who say we can't do this, only Winnipeg, Manitoba, Canada can do this"
- "There is nothing more important than this Taj Mahal, this Eiffel Tower with substance"
- Hundreds of thousands worldwide are "counting on us "
Some insisted it would, and we are not making this up, "put Winnipeg on the map", and recited still - unproven claims of vast legions of eager tourists waiting to disburse huge piles of shekels into the local economy resulting with a quick return to coffers via 'spin-off benefits', and stated that the CMHR is also advancing the cause of peace. None of which addressed the actual details of the motion or the ethical issues presented councillors and the Mayor. The conditions placed upon the transfer of the federal PILT (payment in lieu of taxes) to the CMHR included the requirement "The Museum confirming other sources for the balance of the funding". What, we asked EPC, does "confirming" mean? Well, no clear answer was forthcoming, and the MSM has yet to report on that aspect of the CMHR motion. BUT, one reporter did realize another clause we specifically questioned was newsworthy -- even if who raised the issue didn't make it into print. Did you know the city borrowed money from the Manitoba Development Corporation to give to the Canadian Museum for Human Rights in the first place? When a city councillor was asked ( days before the meeting) what were "the requirements of the Loan Agreement" that had to be met before the next $3.6 million could be forwarded to the CMHR, the councillor had NO IDEA. Even the Canadian Taxpayers Federation had no idea, and they are in the watchdog business. Colin Craig said that before 11.30 AM on Wednesday, when he saw the mention of the loan in the story online, he never heard of it, and that he was baffled by the Province lending money to the City to give to a federal Museum. What EPC heard from TGCTS, also unreported in the media, was that if the city can afford to borrow money, our listeners, members of the Facebook groups, and sponsors of the radio show had some ideas. All serving people in genuine need, like children wanting to go to camp or needing cleft palate surgery, victims of crime or disease, food banks and homeless shelters. The list was read. And to their credit, the councilors listened attentively. They understood our points, that whatever the alleged financial viability of the Museum was, and the political advantages of being onside, that the public demands accountability, that they expected taxes be directed to core services, and most significantly, that many causes and organizations in Winnipeg themselves are having their own budget issues because of donor fatigue. Like a monolithic Walmart, councillors heard the Museum has tapped out the charitable pool in Winnipeg, attributable to what one listener said was "philanthropy bordering on larceny". Meanwhile, Osborne House has 23 children in the emergency shelter with their mothers, 80% of the kids are under 6, and the facility going through supplies at a record pace - over $1000 a week. They have no budget for this kind of demand. To many in this community, including some who wear the Museum support pin, their view of this request for more tax dollars, with so many in need right now, today, in Winnipeg, is that City Council should be helping the people they serve, and the high-profile supporters of the Museum are well capable of either fulfilling their own fundraising needs or tightening their project belts. Mayor Katz spoke with great passion about how doing the PILT refund was 'the right thing to do", and that the legacy of the CMHR would prove the doubters wrong. An invitation to his family Passover Seder was extended for 2012 to counter the Museum pessimism heard at our own table this year. He publicly thanked us for bringing the voice of the people to the debate and bringing up points of view that would otherwise be unheard. Even after voting in support of the motion, which will be heard by all of council next Wednesday, other EPC members privately expressed their own appreciation for us again bringing the message of the people to City Hall. And, a key CMHR official has politely asked to meet and discuss the concerns we presented. They all knew, we were coming back to speak again, and make them at least think about what $3.63 million can do for those in need who cannot afford to dream, before Councillors do the inevitable and assist the millionaires in "need" of a tax break for their own dream. As an organization that provides critical services to Winnipeg’s most vulnerable women and children, Osborne House believes that the City of Winnipeg’s first priority should be to protect the human rights of its most vulnerable. Although we do receive stable annual funding from the Provincial Government, we are dependent upon donations, grants and foundation dollars to survive. We do not receive any direct funding from the City of Winnipeg. City taxpayers benefit tremendously from the services that Osborne House Inc. and many other not for profits that do not receive City of Winnipeg revenues. The need for the City of Winnipeg to become an active partner in supporting the delivery of some of the city’s most vital services is increasing at a significant rate. A city is not a healthy city unless it contributes to the care of the fundamental human rights of its most vulnerable citizens. This Wednesday, 9.30 AM, City Council meeting on Shaw TV, your voice will again be heard. You have the power. 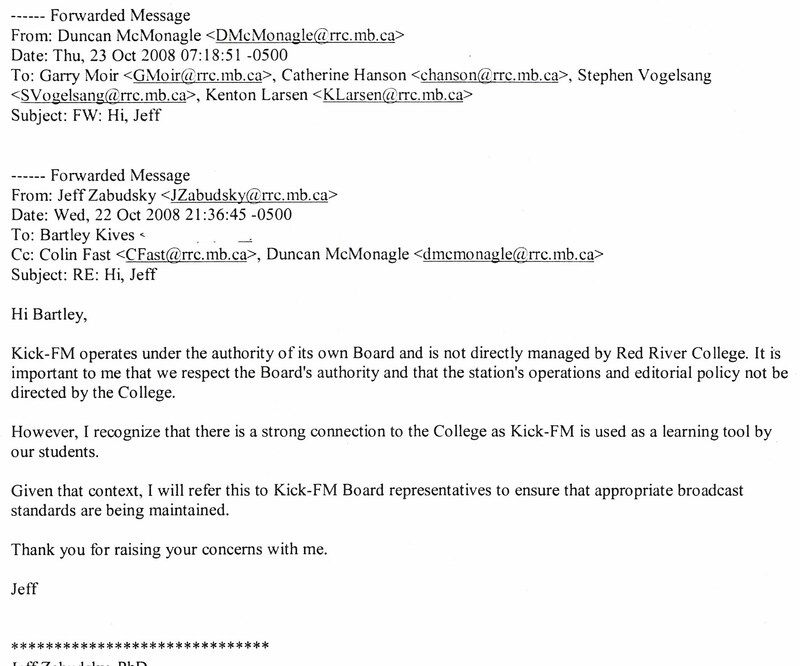 The newspaper that cried to Red River College falsely claiming the campus-funded radio station was not following CRTC regulations, is bragging it has won an award from print colleagues for their own, un-regulated internet streaming coverage, of the final night of the civic election. Let's be clear: the award from the Canadian Newspaper Association is not for Free Press reporting of the Winnipeg races for city hall during the election campaign. In fact, it is not for the quality of the presentation or reporting, at all. It is for merely doing, not for excelling. The award is in "the digital innovation category" in the "Great Ideas competition", for streaming video of election results and commentary on one night only, October 27. That is as far removed from a prize for actual reporting or superior production of a newscast as you can get. It is a newspaper industry award for 'best new gimmick'. And while "staff writer" trumpets "THE Free Press's online coverage of civic election night has won a major industry award", it is in fact, the last one of a half-dozen categories announced. "Earlier this week, Newspapers Canada announced the winners of the 2011 Great Idea Awards. The competition showcases creative marketing materials and campaigns developed by daily and community newspapers across the country in six different categories including newspaper marketing and promotion, promotional campaigns, print advertising, special sections, magazines and digital innovation. " So the FP pats itself on the back not for winning an award with any actual connection to journalism, but for being voted slightly more clever than their partners in the dying dinosaur industry, by streaming voter tabulations online. Wow the standards must be really low if that stuff they had on merits an award. I wouldn't have thought Curtis Brown tripping over his words and overstating the obvious would have ranked so high. The only NNA award category having anything close to a connection with journalism is the special sections category. The Calgary Herald won in the Daily Newspaper (Large Market) competition, for a story about -- The New Mavericks: A Citizen Journalism Project. That kind of award winning JOURNALISM story would of course have been impossible for the Free Press to duplicate. 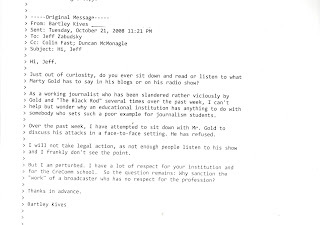 The Free Press editor, Margo Goodhand, detests citizen journalism so much she insisted to Red River College president Stephanie Forsyth that The Great Canadian Talk Show on 92.9 Kick-FM be silenced for exposing the missed stories, flawed and biased reporting, and gatekeeper protection of the pet projects of millionaires and NDP government -- especially during the Winnipeg civic election last fall. Huh? Where was the Free Press during the election? 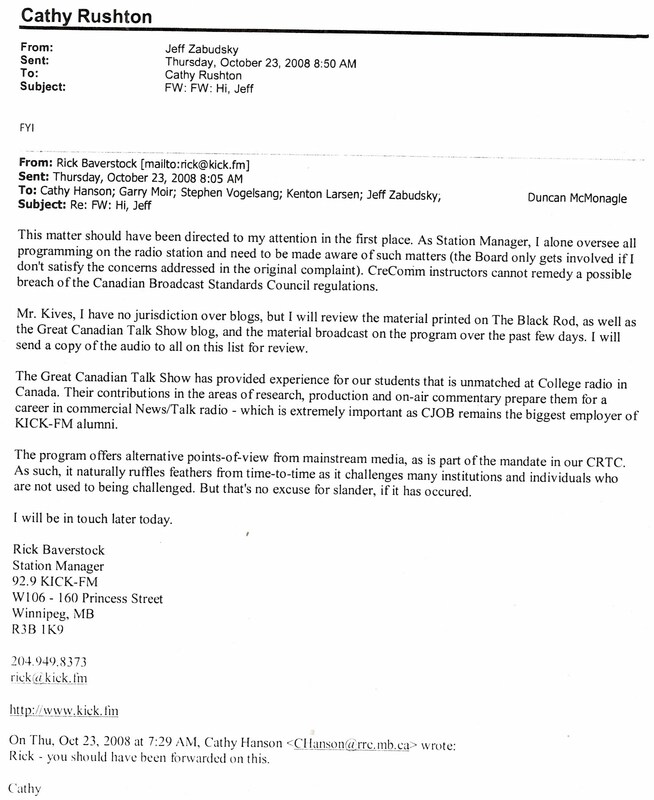 The Great Canadian Talk Show outshone the Free Press 2:1 during the 2010 Civic Election. That was the only outlet that interviewed Judy-W for over 3 hours total and the only media outlet covering the alleged Ross Eadie-NDP campaign financing. That is, alleged by Mr Eadie himself. The Free Press's silly Orlikow-Kowalson non-existent-fight coverage and lack of due civic reporting was duly noted last fall. The fact that bike lanes were treated as a rolling-eyes and laughable "typical Winnipeg" small-time election issue should speak to how this publication views civic issues at large. -- Whether it was bike lanes on Berry St, Sherbrook, Assiniboine, Nassau, Grosvenor (thanks to blogger John Dobbin) or the suspended plan for McDermot, the alternative media exposed the Free Press either missing the story or slanting their coverage. -- Trees being chopped down on Berry, the report confirming the failure of the model for bike lane planning - Argue Street, lack of public consultation resulting in a lawsuit by Assiniboine Avenue businesses ? We led, the Free Press sometimes followed, or ignored the news that did not fit their desired narrative. -- Parents with genuine worries about dangerous narrow traffic circles in East Kildonan and the effect on emergency response units, were first heard on TGCTS. As was the inside story of how the bike lobby co-opts civic officials and double-crosses the public to advance their agenda. Councillor Harvey Smith's call for the firing of the Active Transportation co-ordinator was made on our program, live to a rush hour audience. That news was never reported on by the Mountain Avenue bunch. -- Council candidates ignored by the vast FP election team or dismissed as "gadflys" were able to state their platforms and answer questions from the public at length, without any comments from us about their neat hairdo or how Greg Selinger should recruit them to run for the NDP in the next provincial election. -- 42% of downtown parking meters needing repair, the bullying practices of the parking authority, holding councillors seeking re-election to account for their record, extensive first person reporting on candidate forums, were all part of the practice of election journalism on TGCTS. The result? Kudos and well-wishes from hundreds of listeners and participants, starting with the Free Press' favorite Mayoral candidate, Judy Wasylycia-Leis herself. We cared about ensuring the witnesses who filed official complaints about Ross Eadie's campaign in Norquay had a voice. Only in Winnipeg is the alternative media under siege for reporting the truth about complaints filed regarding a civic election campaign financing scam and holding the mainstream media to account. 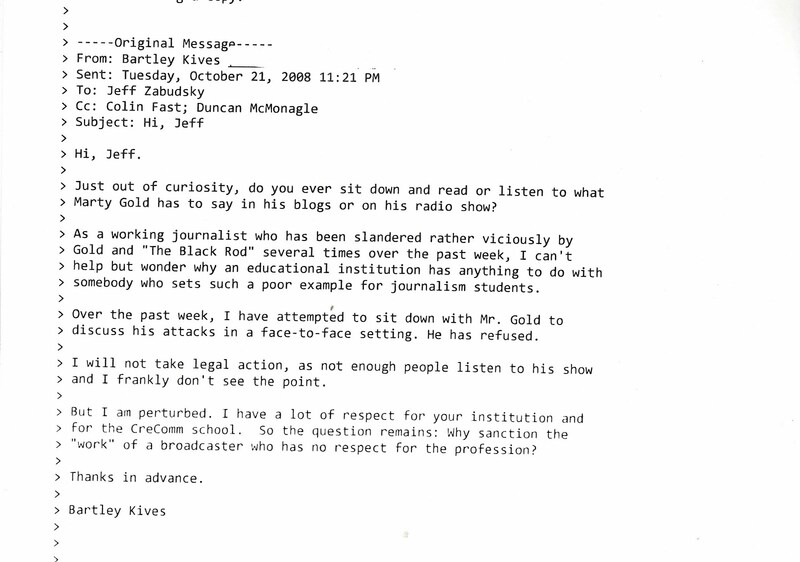 Campus radio citizen journalists cared about freedom of expression, not censorship. Innovative? yes. Award winning? no. We don't care about awards. We care about the people. When you have nothing worth listening to on your radio dial at 4 PM, ask yourself, who did the Winnipeg Free Press care about last October ?